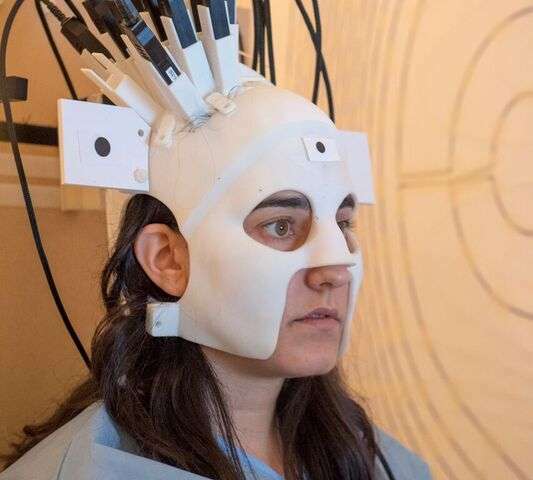 Magnetoencephalography (MEG) is a technique for mapping brain activity - it measures the magnetic fields generated by electrical currents that occur naturally in the brain. A £1.6m Collaborative Award in Science from Wellcome is funding the construction of a new type of MEG scanner which, if successful, could quadruple the sensitivity of current state of the art devices. Dr Matthew Brookes and Professor Richard Bowtell, in the School of Physics and Astronomy are leading the research in Nottingham, where they have already designed and built a 3-D printed prototype wearable helmet and are in the very early stages of developing the new MEG system. Images are available via this dropbox link. Dr Brookes said: "Quantum technology has allowed the development of a new type of optical sensor which has the sensitivity to detect the weak magnetic fields from the brain. Unlike current technology, these new sensors can operate at room temperature, so they can be placed directly on the scalp surface. Our calculations show that by getting the sensors closer to the head we can quadruple the sensitivity of the field detection. This will revolutionise the kind of effect that we are able to detect from the human brain." Most current MEG systems are cumbersome, built around a small bore into which a participant's head is gently clamped because the sensors, which have to be kept at minus 269 degrees, cannot be moved. It is a static, one-size-fits-all system. This artificial environment restricts both the subject groups that can be scanned and the experimental questions that can be addressed. The collaborative team began working in this area 2 years ago, assessing the potential of quantum sensors in computational simulations. Following this, using pump-priming funding from UCL and the University of Nottingham, the team purchased a small number of quantum sensors, and used them to show, experimentally, that the expected improvement in sensitivity could become a reality. Based on this pilot data, they have now received the Wellcome award to construct a fully functional multi-channel MEG system based on quantum sensors – of which £800,000 is funding the work in Nottingham. While the physics-based development needed to make the scanner work is being carried out in Nottingham, experts at UCL are carrying out detailed computational and theoretical modelling of the brain to frame the neuroscience and establish what neuroscience questions can be addressed. 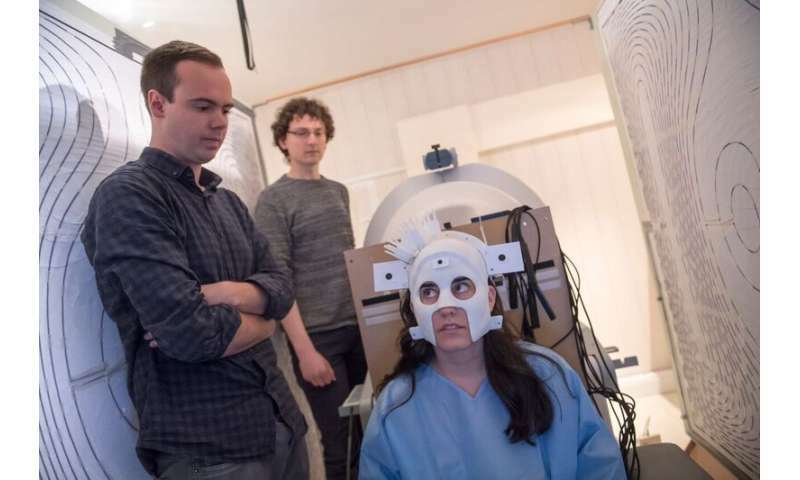 The research project, 'Moving functional brain imaging into the real world: A wearable, cryogen-free, MEG system', is led by Professor Gareth Barnes, in the Wellcome Trust Centre for Neuroimaging at UCL. He said: "The realisation of this system is a huge, but extremely exciting, challenge, with the potential to revolutionise the brain imaging field. Our simulations and pilot experiments have already shown the unique potential of the new quantum sensors." Professor Barnes continued: "Our scanner will be worn on the head like a helmet, meaning subjects can undertake tasks whilst moving freely in an open and natural environment." The new scanner has the potential to revolutionise brain imaging for all subjects, but will be particularly useful in children. Professor Richard Bowtell, grant co-applicant and Director of the Sir Peter Mansfield Imaging Centre in Nottingham said: "Because MEG systems are essentially 'one size fits all', sensitivity is limited for subjects with smaller heads such as infants since their heads are further from the detectors. Room temperature quantum sensors can be mounted directly on the scalp of any subject. This will give us a projected four-fold increase in sensitivity for adults, but the sensitivity could potentially be up to a 15 or 20 fold increase for children or babies." The first stage of their work has already been published. What the research team really want to do is translate this technology into neuroscience and ultimately a clinical tool for conditions such as drug resistant epilepsy and schizophrenia.